Thebes (Ancient Greek: Θῆβαι, Thēbai), known to the ancient Egyptians as Waset, was an ancient Egyptian city located along the Nile about 800 kilometers (500 mi) south of the Mediterranean. Its ruins lie within the modern Egyptian city of Luxor. Thebes was the main city of the fourth Upper Egyptian nome (Sceptre nome) and was the capital of Egypt mainly during the Middle Kingdom and the New Kingdom. It was close to Nubia and the Eastern Desert, with its valuable mineral resources and trade routes. It was a cult center and the most venerated city of ancient Egypt during its heyday. The site of Thebes includes areas on both the eastern bank of the Nile, where the temples of Karnak and Luxor stand and the city proper was situated; and the western bank, where a necropolis of large private and royal cemeteries and funerary complexes can be found. The Egyptian name for Thebes was wꜣs.t, "City of the wꜣs", the sceptre of the pharaohs, a long staff with an animal's head and a forked base. From the end of the New Kingdom, Thebes was known in Egyptian as niwt-'imn, the "City of Amun", the chief of the Theban Triad of deities whose other members were Mut and Khonsu. This name of Thebes appears in the Bible as the "Nōʼ ʼĀmôn" (נא אמון) in the Book of Nahum and also as "No" (נא) mentioned in the Book of Ezekiel and Jeremiah. In the interpretatio graeca, Amun was rendered as Zeus Ammon. The name was therefore translated into Greek as Diospolis, "City of Zeus". To distinguish it from the numerous other cities by this name, it was known as the "Great Diospolis" (Διόσπολις Μεγάλη, Dióspolis Megálē; Latin: Diospolis Magna). The Greek names came into wider use after the conquest of Egypt by Alexander the Great, when the country came to be ruled by the Macedonian Ptolemaic dynasty. Thebes was located along the banks of the Nile River in the middle part of Upper Egypt about 800 km from the Delta. It was built largely on the alluvial plains of the Nile Valley which follows a great bend of the Nile. As a natural consequence, the city was laid in a northeast-southwest axis parallel to the contemporary river channel. Thebes had an area of 93 km2 (36 sq mi) which included parts of the Theban Hills in the west that culminates at the sacred 420-meter (1,378-foot) al-Qurn. In the east lies the mountainous Eastern Desert with its wadis draining into the valley. Significant among these wadis is Wadi Hammamat near Thebes. It was used as an overland trade route going to the Red Sea coast. In the fourth Upper Egyptian nome, Thebes was found to have neighboring towns such as Per-Hathor, Madu, Djerty, Iuny, Sumenu and Imiotru. According to George Modelski, Thebes had about 40,000 inhabitants in 2000 BC (compared to 60,000 in Memphis, the largest city of the world at the time). By 1800 BC, the population of Memphis was down to about 30,000, making Thebes the largest city in Egypt at the time. Historian Ian Morris estimated that by 1500 BC, Thebes may have grown to be the largest city in the world, with a population of about 75,000, a position which it held until about 900 BC, when it was surpassed by Nimrud (among others). The archaeological remains of Thebes offer a striking testimony to Egyptian civilization at its height. The Greek poet Homer extolled the wealth of Thebes in the Iliad, Book 9 (c. 8th Century BC): "... in Egyptian Thebes the heaps of precious ingots gleam, the hundred-gated Thebes." More than sixty annual festivals were celebrated in Thebes. The major festivals among these according to the Edfu Geographical Text were: the Beautiful Feast of Opet, the Khoiak (Festival), Festival of I Shemu, and Festival of II Shemu. Another popular festivity was the halloween-like Beautiful Festival of the Valley. 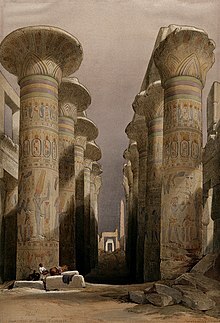 Thebes was inhabited from around 3200 BC. It was the eponymous capital of Waset, the fourth Upper Egyptian nome. At this time it was still a small trading post while Memphis served as the royal residence of Old Kingdom pharaohs. Although no buildings survive in Thebes older than the portions of the Karnak temple complex, which may date from the Middle Kingdom, the lower part of a statue of Pharaoh Nyuserre of the 5th Dynasty has been found in Karnak. Another statue which was dedicated by the 12th Dynasty king Senusret may have been usurped and re-used, since the statue bears a cartouche of Nyuserre on its belt. Since seven rulers of the 4th to 6th Dynasties appear on the Karnak king list, perhaps at the least there was a temple in the Theban area which dated to the Old Kingdom. By 2160 BC, a new line of pharaohs (the Ninth and Tenth Dynasties) consolidated Lower Egypt and northern parts of Upper Egypt from their capital in Herakleopolis Magna. A rival line (the Eleventh Dynasty) based at Thebes ruled the remaining part of Upper Egypt. The Theban rulers were apparently descendants of the prince of Thebes, Intef the Elder. His probable grandson Intef I was the first of the family to claim in life a partial pharaonic titulary, though his power did not extend much further than the general Theban region. Finally by c. 2050 BC, Intef III's son Mentuhotep II (meaning "Montu is satisfied"), took the Herakleopolitans by force and reunited Egypt once again under one ruler, thereby starting the period now known as the Middle Kingdom. Mentuhotep II ruled for 51 years and built the first mortuary temple at Deir el-Bahri, which most likely served as the inspiration for the later and larger temple built next to it by Hatshepsut in the 18th Dynasty. After these events, the 11th Dynasty was short-lived, as less than 20 years had elapsed between the death of Mentuhotep II and that of Mentuhotep IV, in mysterious circumstances. During the 12th Dynasty, Amenemhat I moved the seat of power North to Itjtawy. Thebes continued to thrive as a religious center as the local god Amun was increasingly becoming prominent throughout Egypt. The oldest remains of a temple dedicated to Amun date to the reign of Senusret I. Thebes was already, in the Middle Kingdom a town of considerable size. Excavations around the Karnak temple show that the Middle Kingdom town had the layout with a grid pattern. The city was at least one kilometer long and 50 hectares in area. Remains of two palatial buildings were also detected. Starting in the later part of the 12th Dynasty, a group of Canaanite people began settling in the eastern Nile Delta. They eventually founded the 14th Dynasty at Avaris in c. 1805 BC or c. 1710 BC. By doing so, the Asiatics established hegemony over the majority of the Delta region, subtracting these territories from the influence of the 13th Dynasty that had meanwhile succeeded the 12th. A second wave of Asiatics called Hyksos (from Heqa-khasut, "rulers of foreign lands" as Egyptians called their leaders) immigrated into Egypt and overran the Canaanite center of power at Avaris, starting the 15th Dynasty there. The Hyksos kings gained the upper hand over Lower Egypt early into the Second Intermediate Period (1657-1549 BC). When the Hyksos took Memphis during or shortly after Merneferre Ay's reign (c. 1700 BC), the rulers of the 13th Dynasty fled south to Thebes, which was restored as capital. Theban princes (now known as the 16th Dynasty) firmly stood over their immediate region as the Hyksos advanced from the Delta southwards to Middle Egypt. The Thebans resisted the Hyksos' further advance by forming an agreement for a peaceful concurrent rule between them. The Hyksos were able to sail upstream past Thebes and some Nile cataracts to trade with the Nubians and the Thebans brought their herds to the Delta without adversaries. The status quo continued until Hyksos ruler Apophis (15th Dynasty) insulted Seqenenre Tao (17th Dynasty) of Thebes. Soon the armies of Thebes marched on the Hyksos-ruled lands. Tao died in battle and his son Kamose took charge of the campaign. After Kamose's death, his brother Ahmose I continued till he captured Avaris, the Hyksos capital. Ahmose I drove the Hyksos out of Egypt and the Levant and reclaimed the lands formerly ruled by them. Ahmose I founded a new age for a unified Egypt with Thebes as its capital. The city remained as capital during most of the 18th Dynasty (New Kingdom). It also became the center for a newly established professional civil service, where there was a greater demand for scribes and the literate as the royal archives began to fill with accounts and reports. At the city the favored few of Nubia were reeducated with Egyptian culture, to serve as administrators of the colony. With Egypt stabilized again, religion and religious centers flourished and none more so than Thebes. For instance, Amenhotep III, poured much of his vast wealth from foreign tribute into the temples of Amun. The Theban god Amun became a principal state deity and every building project sought to outdo the last in proclaiming the glory of Amun and the pharaohs themselves. Thutmose I (reigned 1506-1493 BC) began the first great expansion of the Karnak temple. After this, colossal enlargements of the temple became the norm throughout the New Kingdom. Queen Hatshepsut (reigned 1479-1458 BC) made the Theban economy flourish by renewing trade networks, primarily the Red Sea trade between Thebes' Red Sea port of Al-Qusayr, Elat and the land of Punt. Her successor Thutmose III brought to Thebes a great deal of his war booty that originated from as far as Mittani. The 18th Dynasty reached its peak during his great-grandson Amenhotep III's reign (1388–1350 BC). Aside from embellishing the temples of Amun, Amenhotep increased construction in Thebes to unprecedented levels. On the west bank, he built the enormous mortuary temple and the equally massive Malkata palace-city which fronted a 364-hectare artificial lake. In the city proper he built the Luxor temple and the Avenue of the Sphinxes leading to Karnak. For a brief period in the reign of Amenhotep III's son Akhenaten (1351–1334 BC), Thebes fell on evil times; the city was abandoned by the court, and the worship of Amun was proscribed. The capital was moved to the new city of Amarna (Akhetaten), midway between Thebes and Memphis. After his death, his son Tutankhamun made a return to Memphis, but renewed interest in building projects at Thebes which produced even more glorious temples and shrines. With the 19th Dynasty the seat of government moved to the Delta. Thebes maintained its revenues and prestige through the reigns of Seti I (1290–1279 BC) and Ramesses II (1279–1213 BC), who still resided for part of every year in Thebes. Ramesses II carried out extensive building projects in the city such as statues and obelisks, the third enclosure wall of Karnak temple, additions to the Luxor temple, and the Ramesseum, his grand mortuary temple. The constructions were bankrolled by the large granaries (built around the Ramesseum) which concentrated the taxes collected from Upper Egypt; and by the gold from expeditions to Nubia and the Eastern Desert. Under Ramesses' long 66-year reign, Egypt and Thebes reached an overwhelming state of prosperity which equaled or even surpassed the earlier peak under Amenhotep III. The city continued to be well kept in the early 20th Dynasty. The Great Harris Papyrus states that Ramesses III (reigned 1187–56) donated 86,486 slaves and vast estates to the temples of Amun. Ramesses III received tributes from all subject peoples including the Sea Peoples and Meshwesh Libyans. However, the whole of Egypt was experiencing financial problems, exemplified in the events at Thebes' village of Deir el-Medina. In the 25th year of his reign, workers in Deir el-Medina began striking for pay and there arose a general unrest of all social classes. Consequently, an unsuccessful harem revolt led to the deaths of many, including Theban officials and women. Under the later Ramessids, Thebes began to decline; the government fell into grave economic difficulties. 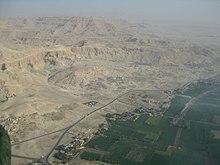 During the reign of Ramesses IX (1129–1111 BC), about 1114 BC, a series of investigations into the plundering of royal tombs in the necropolis of western Thebes uncovered proof of corruption in high places, following an accusation made by the mayor of the east bank against his colleague on the west. The plundered royal mummies were moved from place to place and at last deposited by the priests of Amun in a tomb-shaft in Deir el-Bahri and in the tomb of Amenhotep II. (The finding of these two hiding places in 1881 and 1898, respectively, was one of the great events of modern archaeological discovery.) Such maladministration in Thebes led to unrest. Control of local affairs tended to come more and more into the hands of the High Priests of Amun, so that during the Third Intermediate Period, the High Priest of Amun exerted absolute power over the South, a counterbalance to the 21st and 22nd Dynasty kings who ruled from the Delta. Intermarriage and adoption strengthened the ties between them, daughters of the Tanite kings being installed as God’s Wife of Amun at Thebes, where they wielded greater power. Theban political influence receded only in the Late Period. By around 750 BC, the Kushites (Nubians) were growing their influence over Thebes and Upper Egypt. Kush, the former colony of Egypt became an empire in itself. In 721 BC, King Shabaka of the Kushites defeated the combined forces of Osorkon IV (22nd Dynasty), Peftjauawybast (23rd Dynasty) Bakenranef (24th Dynasty) and reunified Egypt yet again. His reign saw a significant amount of building work undertaken throughout Egypt, especially at the city of Thebes, which he made the capital of his kingdom. In Karnak he erected a pink granite statue of himself wearing the Pschent (the double crown of Egypt). Taharqa accomplished many notable projects at Thebes (i.e. the Kiosk in Karnak) and Nubia before the Assyrians started to wage war against Egypt. "This city, the whole of it, I conquered it with the help of Ashur and Ishtar. Silver, gold, precious stones, all the wealth of the palace, rich cloth, precious linen, great horses, supervising men and women, two obelisks of splendid electrum, weighing 2,500 talents, the doors of temples I tore from their bases and carried them off to Assyria. With this weighty booty I left Thebes. Against Egypt and Kush I have lifted my spear and shown my power. With full hands I have returned to Nineveh, in good health." Thebes never regained its former political significance, but it remained an important religious centre. Assyrians installed Psamtik I (664-610 BC), who ascended to Thebes in 656 BC and brought about the adoption of his own daughter, Nitocris I, as heiress to God's Wife of Amun there. In 525 BC, Persian Cambyses II invaded Egypt and became pharaoh, subordinating the kingdom as a satrapy to the greater Achaemenid Empire. The good relationship of the Thebans with the central power in the North ended when the native Egyptian pharaohs were finally replaced by Greeks, led by Alexander the Great. He visited Thebes during a celebration of the Opet Festival. In spite of his welcoming visit, Thebes became a center for dissent. Towards the end of the third century BC, Hugronaphor (Horwennefer), possibly of Nubian origin, led a revolt against the Ptolemies in Upper Egypt. His successor, Ankhmakis, held large parts of Upper Egypt until 185 BC. This revolt was supported by the Theban priesthood. After the suppression of the revolt in 185 BC, Ptolemy V, in need of the support of the priesthood, forgave them. Half a century later the Thebans rose again, elevating a certain Harsiesi to the throne in 132 BC. Harsiesi, having helped himself to the funds of the royal bank at Thebes, fled the following year. In 91 BC, another revolt broke out. In the following years, Thebes was subdued, and the city turned into rubble. During the Roman occupation (30 BC-349 AD), the remaining communities clustered around the pylon of the Luxor temple. Thebes became part of the Roman province of Thebais, which later split into Thebais Superior, centered at the city, and Thebais Inferior, centered at Ptolemais Hermiou. A Roman legion was headquartered in Luxor temple at the time of Roman campaigns in Nubia. Building did not come to an abrupt stop, but the city continued to decline. In the first century AD, Strabo described Thebes as having been relegated to a mere village. Great Temple of Amun at Karnak (Ancient Egyptian Ta-opet). Still the second largest religious building ever built, it is the main house of worship for Amun, Thebes' patron deity, and the residence of the powerful Amun priesthood. What differentiated it from the many temples of Egypt is the length of time it was built over (more than 2,000 years, starting in the Middle Kingdom). The main features of this temple are its ten large pylons, the Great Hypostyle Hall, a sacred lake, sub-temples, numerous shrines and multiple obelisks. It was the most important temple for a majority of Ancient Egyptian history. Luxor Temple (Ipet resyt). Unlike the other temples in Thebes, it is not dedicated to a cult god or a deified version of the king in death. Instead, it is dedicated to the rejuvenation of kingship; it may have been where many of the pharaohs of Egypt were crowned. It is a centerpiece of the "Opet Festival", where the sacred barque of the Theban Triad travels from Karnak to Luxor temple highlighting the godly significance of the pharaoh's re-coronation . In 1979, the ruins of ancient Thebes were classified by UNESCO as a World Cultural Heritage site. The two great temples—Luxor Temple and Karnak—and the Valley of the Kings and the Valley of the Queens are among the great achievements of ancient Egypt. From 25 October 2018 to 27 January 2019, the Museum of Grenoble organizes with the support of the Louvre and the British Museum, a three-month exhibition on the city of Thebes and the role of women in the city at that time. ^ Pausanias records that owing to its "connection" with the Egyptian city, the Boeotian Thebes also had an idol and temple of Amun from the 5th century BC. ^ Adolf Erman and Hermann Grapow: Wörterbuch der ägyptischen Sprache. Akademie Verlag, Berlin 1971. p. 259. ^ Erman/Grapow: Wörterbuch der ägyptischen Sprache, p. 211. ^ Erman/Grapow: Wörterbuch der ägyptischen Sprache, pp. 54,479. ^ Huddlestun, John R. “Nahum, Nineveh, and the Nile: The Description of Thebes in Nahum 3:8–9.” Journal of Near Eastern Studies, vol. 62, no. 2, 2003, pp. 97–98. ^ Iliad, IV.406 and IX.383. ^ Description of Greece, IX.16 §1. ^ George Modelski, "Cities of the Ancient World: An Inventory (−3500 to −1200) Archived 2014-05-19 at the Wayback Machine"; see also list of largest cities throughout history. ^ Ian Morris, "Social Development Archived 2011-07-26 at the Wayback Machine"; see also list of largest cities throughout history. ^ Karnak (Thebes), Egypt. Ancient-wisdom.co.uk. Retrieved on 2013-07-29. ^ Wilkinson (2011), pp. 188 ff. ^ Margaret Bunson, "Encyclopedia of Ancient Egypt"
^ RAMESSES III: THE LAST GREAT PHARAOH. http://www.greatdreams.com/. Retrieved on 2016-02-06. ^ The fall of Thebes to the Assyrians and its decline thereafter. http://www.reshafim.org.il/. Retrieved on 2016-02-06. ^ (in French) museedegrenoble.fr, Servir les dieux d'Égypte (Serving the Gods of Egypt, Adoratrices, Songstresses, and Priests of Amun at Thebes). Wikimedia Commons has media related to Thebes. Wikimedia Commons has media related to Theban Necropolis.